Goldwell Trendline Natural - Light Kiss Flexible Spray 9 oz. 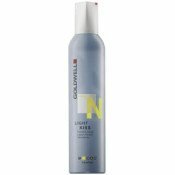 Goldwell Trendline Natural - Light Kiss Flexible Spray is a lightweight, flexible hairspray for natural hairstyles. Keeps hair feeling soft and natural. Notify me of updates to Goldwell Trendline Natural - Light Kiss Flexible Spray 9 oz.